Super Bowl 18 is back and in this guide we’ve got all the information you’re going to need to be able to watch it online from anywhere in the world. This year’s Super Bowl which is also known as Super Bowl LII takes place between the New England Patriots and the Philadelphia Eagles. Unfortunately though you may find that the event isn’t even being shown in your country. Or if it is then it’s restricted to expensive cable networks that you don’t have access to. Never fear, below we’re going to show how in just 5 steps by using an app called a VPN you can watch Super Bowl 18 online from any country in the world. Best of all there are no expensive cable subscriptions or sketchy illegal streams in sight. The Super Bowl 2018 is being shown live online completely for free by UK streaming service BBC iPlayer. If you’re not in the UK you’ll be blocked from viewing but with a VPN you can unblock this stream easily. A VPN will cost just a few pounds or dollars and can be used for other things too which we explore further down in this guide. Just follow the 5 simple steps below to watch Super Bowl 2018 online anywhere. Visit the VPN provider NordVPN and sign-up to their service. Download their app for your device from the VPN Apps section of their website. Install the app, run it and login with your account details. 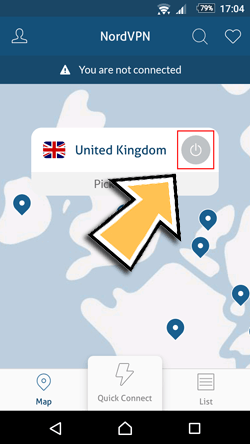 Select and click on United Kingdom on the map. If it doesn’t automatically connect slide the power button. 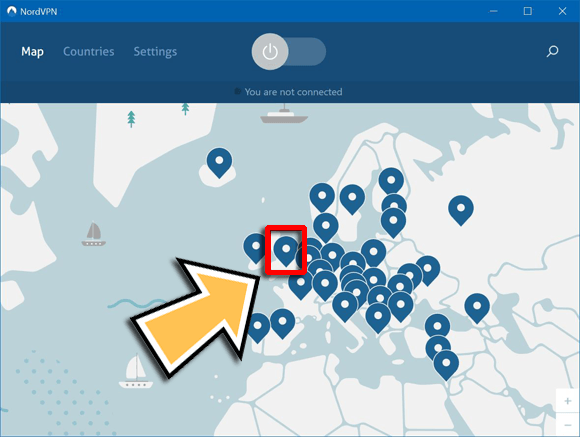 It takes a few seconds for the NordVPN app to get connected. Once it’s connected you can head over the the BBC iPlayer BBC One page where you’ll be able to watch the entire Super Bowl 2018 from anywhere in the world. When you’ve finished watching you can simply disconnect from the NordVPN and everything returns to normal. You can connect and disconnect as many times as you wish and use it for other purposes such as watching the up and coming Winter Olympic Games. If you’ve got an Android mobile or tablet and you want to watch the Super Bowl 2018 then it’s entirely possible but as well as getting a VPN you’ll also need to install the BBC iPlayer app if you haven’t already. Visit the VPN provider NordVPN and sign-up. Search for “NordVPN” on the Google Play Store and install the app. Visit this link on your Android browser to download and install the BBC iPlayer app. Launch the NordVPN app and login. Select United Kingdom and Connect. Launch the BBC iPlayer app. Once the app has connected you’ll now be able to watch all the Super Bowl 2018 action live on BBC One on the BBC iPlayer app anywhere in the world. When you’ve finished watching simply disconnect from the NordVPN app and everything reverts back to normal. Super Bowl 2018 or Super Bowl LII as it’s otherwise known is taking place on Sunday February 4th, 2018. Kick-off time in the United States is 18:30 ET which is 23:30 GMT in the UK and coverage starts from 18:15 ET or 23:15 GMT on BBC One which is accessible via their website or the app as detailed earlier in this guide. The football event is taking place at the U.S. Bank Stadium in Minneapolis, Minnesota. The final takes place between the New England Patriots and the Philadelphia Eagles. The Eagles will be trying to take their first Super Bowl title but after the Patriots won the 2017 Super Bowl it’ll be an up hill struggle for the Eagles. The Patriots are five time winners of the Super Bowl so we would expect them to be adding a sixth title to their trophy cabinet this year but there is always the chance of an upset. The underdog Eagles have nothing to lose and everything to prove which could spur them on to a win. You’ll be glad to be able to watch online live from home because the cheapest tickets to watch the game cost an eye-watering $3000. As much as the Super Bowl is one of the biggest sporting events half the fun is watching the half time entertainment and the commercials. Everyone from the likes of Beyonce to Michael Jackson and the Rolling Stones have played the Super Bowl half time and who could forget the wardrobe malfunction of Janet Jackson? This year Justin Timberlake is back for his third time to entertain and wow the crowds. You’ll be able to take in the performance from the comfort of your own home when watching online with a VPN. If smooth-hips Timberlake isn’t enough to wet your entertainment appetite then Philadelphia native Pink will be signing the National Anthem in advance of the game taking place. The Patriots vs Eagles is expected to be an explosive game and you can watch all of the Super Bowl 2018 action live online by getting yourself a VPN. Just click the button below to visit our recommended VPN provider for watching the Super Bowl and follow the instructions from earlier in this guide so you won’t miss out on a moment of the biggest American Football event of the year.